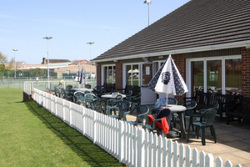 The ​Devizes Sports Club is an ideal venue for business use. Our main room offers light, open space for all types of corporate events. From team building excercises to product launches we have packages available to suit all needs. Our members bar is the perfect location for smaller, intimate meetings or training sessions. We are delighted to announce that the members bar at Devizes Sports Club has recently been refurbished as part of the RFU's social spaces for the 2015 Rugby World Cup in England. This ideal location is now available for all existing members and also available for hire for corporate use. For booking and enquiries please complete the on-line enquiry form or contact Emma at the Devizes Sports Club on 01380 729652 or 0793 8538133 for more details.